So I know you have all just been in breathless suspense wondering what happened after the birthday party I last blogged about. Well, wait no more your update on June 30 - July 5 is here! 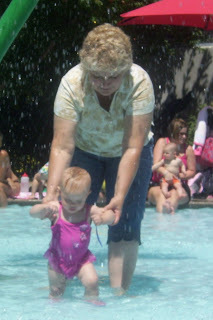 On Avery's actual birthday, Grams, BobBob and I took Avery to the wading pool downtown. This was her first visit and she had a blast!! 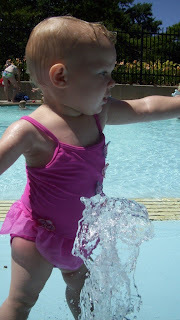 She also looked adorable in the little pink swimsuit. People kept asking us if she was the first child/grandchild. 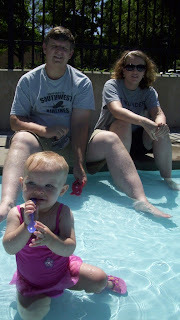 Hmmm, could it be that all 3 of us had either a camera or video camera on her the whole time? Then just 3 days later, we left Lawrence and embarked on the longest road trip Avery has been on. From Lawrence, KS, to Texarkana, TX, to Bridgeport, TX, to Lubbock, TX, to Ruidoso, NM, and back. Today I will just post photos from Texarkana. Here we visited with Kevin's brother and his family as well as Kevin's parents. 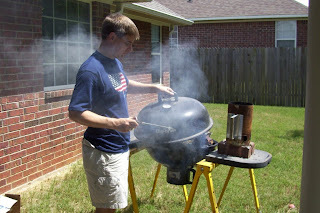 We were there on Eric's birthday and he requested that Kevin smoke a brisket. Here is Kevin with the 'smoke'. The brisket turned out wonderfully! 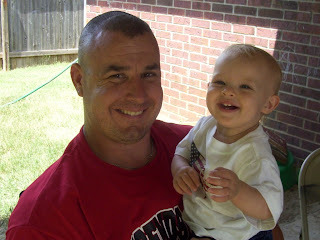 Here is Avery with her Uncle Eric. Just about the sweetest picture ever! 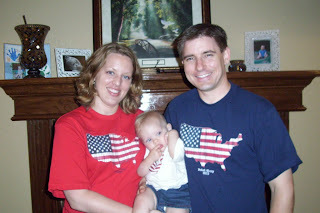 We were also there over the 4th of July which our family celebrated with matching T-shirts. We also tried watching some fireworks, but Avery drew the line on what she could handle in a weekend by protesting the noise. We celebrated Uncle Eric, Cousin Tate, and Avery's birthday in one big party. 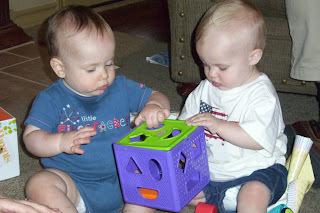 Tate and Avery both turned 1 within a week of each other. 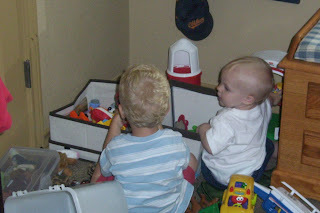 Here they are enjoying their new toys. I must say I was very impressed with how well the kids played together all weekend. 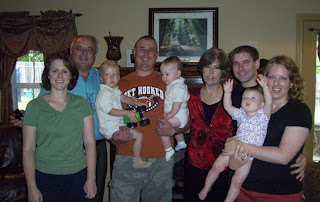 Here is a shot of the whole clan. We had a great weekend and enjoyed seeing everyone. What great pictures! Looking at your map I can't beleive you did the whole trip! Job well done, now that it is over. Glad we got put on your list, I now see the advantage of being in Texas. The picture of Eric with Avery is adorable!